STORY OF THIS DRESS: I posted this dress on one of my shopbop round ups last month and my sister in law bought it. I remember being on the fence and after just placing a big order for myself I decided to skip it. Whelp! Fast forward a couple of weeks when I saw her in town...I was with a client and we both looked at her and said we have to get this dress!! It was sold out on shopbop (just popped back up in one size) but I found it here in all sizes and on sale. I will warn you (if you can't tell by the pics hehe) it is short. My rule for short dresses is as long as they have a sleeve and don't show cleavage its OK. This dress would also be great when you step off the beach to have lunch or shop and leave your swimwear on underneath. In other news I wanted to share a new product with you that I'm LOVING! My beauty mission this year was been to incorporate as many natural and organic products as I can. Organachs Farm to Skin in Westport, CT has been the ultimate destination and resource for all things clean. Last month I went to Siobhan looking for sunblock for an upcoming trip to Florida. She suggested I try this nutrient day cream and ever since I've been hooked! I use the tinted one but there is also a non-tinted version. It is super light and I never feel like I'm wearing sunscreen. Check out her website! Posted on June 8, 2018 by Stephanie Trotta and filed under Outfits and tagged skincare sunscreen josh rosebrook mini dress wrap dress ray ban sunglasses theory moto jacket linen bicycle schwinn. This was a weird week! Did anyone else feel like it was going to go quickly on Tuesday but by Thursday it was dragging? 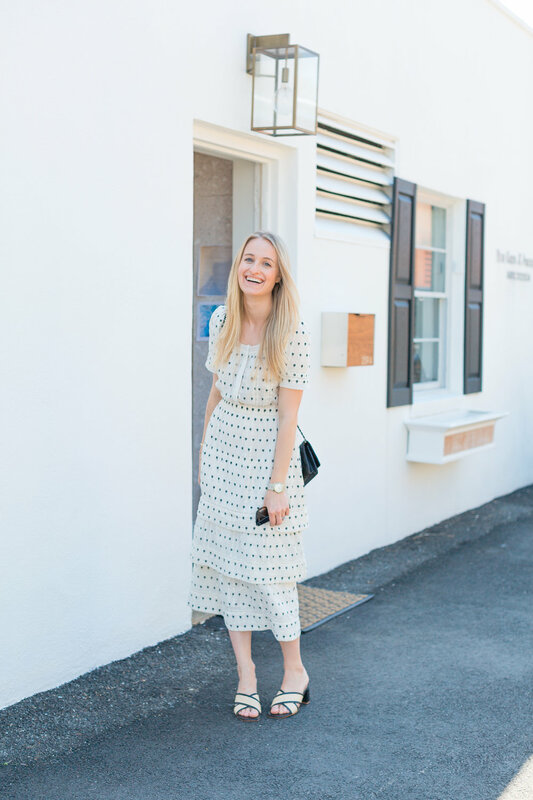 My plan was to save this outfit post for next week but I loved it so much that I decided to share it today! I saw this top at a boutique a couple weeks ago and had to have it but couldn't pull the trigger on the spot. I do that A LOT! If I can't stop thinking about something thats when I know I I should buy it. The color goes with everything and it will also work in the fall under cardigans and leather jackets. The one tagged about looks like its selling out but I found it here too in three colors and here in a slate gray. ALSO I ordered this dress a couple months ago when I tagged it on the blog and love it! It recently sold out on shopbop but I found it HERE for under $40! It will not dissapoint (I ordered a XS)! Posted on June 1, 2018 by Stephanie Trotta and filed under Outfits and tagged vince silk top ray ban sunglasses straight hair inner light chloe levis wedgie jean marc fisher crossbody bag. I love wearing dresses! My Summer style is a little more boho than my Fall/Winter and I love this "prairie" chic look. This style and fabric is also super packable and a great style for vacation that you can dress up or down. I like to throw a fancier shoe in my bag along with a pair of earrings that will take my look to dinner after a day of sightseeing, shopping, etc. This white splurge one is a DREAM! Posted on May 8, 2018 by Stephanie Trotta and filed under Outfits and tagged loveshackfancy lily chanel celine sunglasses. Last month I asked my readers what what they wanted to see more of on the blog and so many of you asked for outfit ideas for work. There are a hundred ways to break this one down but I decided to start with a casual office look because I believe it can be the most challenging. Lets break it down: you don't have to wear a suit, but you need to look professional, no denim (ignore that I'm wearing black jeans in these pics! ), and you want to look sophisticated and chic all the while not wearing anything too revealing. Like I said, its a challenge! I always tell my husband he has it so easy - casual for the guys means a nice pair of khakis or dress paints and a button down or a nice sweater. Hi answer is always that his options are boring at which point I have to agree. So I've rounded up options for every budget and my advice is to make investments on timeless pieces that you can wear over and over again...like this twist on a classic and this ivory silk blouse. High/low dressing is at its finest in the office and mixing a Mango pant with a pair of investment pumps is the perfect solution to creating 6 months worth of outfits on a limited budget. Also this silk bow blouse is perfect and a must for any working girl. I love it because you can throw it on with a pair of jeans after work and head out for a date night. Lastly, if you're going to splurge on prints go for plaid! Posted on February 26, 2018 by Stephanie Trotta and filed under What to Wear, Outfits and tagged work frame mango gucci loafer celine nano theory 2.0 sunglasses steal vs plurge. So excited to share my first gift guide with you guys! I'm a firm believer in "less is more" when it comes to gift-giving. I believe that thought does count and whether you're going to splurge on a gift or looking for something small, it shows when you've put in that extra effort. One of my favorite brands to shop gifts no matter what the occasion is Cuyana. They have a wide range of price points and the quality of their goods is incredible. Frank bought me this travel case last year for Christmas and I use it ALL the time! 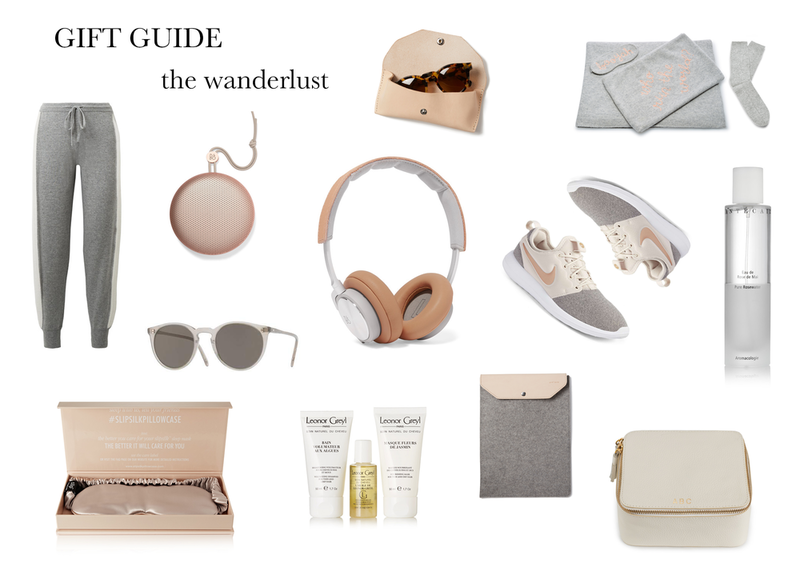 Posted on December 5, 2017 by Stephanie Trotta and filed under Lust List and tagged wanderlust headphones travel luxury travel nike lingua franca theory oliver peoples sunglasses gift guide.